At launch, the Lincoln Aviator will be available with two engines. They're both twin-turbocharged 3.0-liter V6s, and one of them is a plug-in hybrid. The standard engine makes an impressive 400 horsepower and 400 pound-feet of torque. To help put that into perspective, that's about 40 more horsepower than the top-rung six-cylinder Mercedes-Benz GLE 450 we just drove, and about 65 more horsepower than the entry-level six-cylinder BMW X5 xDrive40i. Moving to the hybrid powertrain brings Aviator output to 450 horsepower and a staggering 600 pound-feet of torque. That's just 6 ponies shy of the V8-powered BMW X5 xDrive50i, but 121 more pound-feet of torque. hbmf3 and ewf like this. Interesting that the handles are fixed. 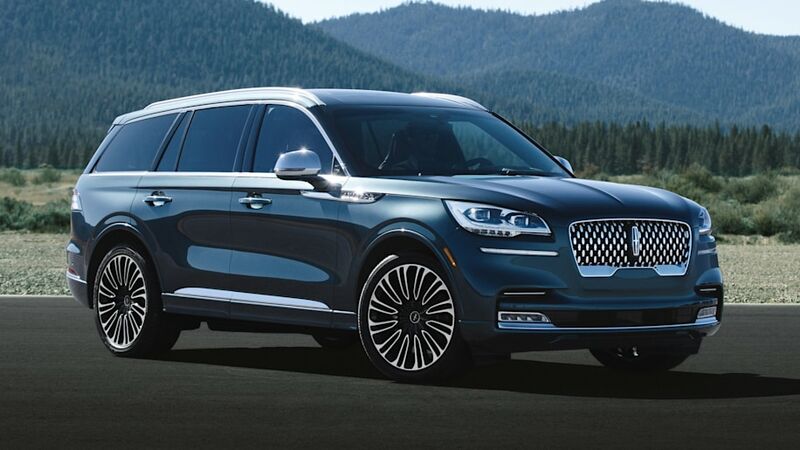 LOS ANGELES, Nov. 28, 2018 – The all-new 2020 Lincoln Aviator touches down at the Los Angeles Auto Show this week with advanced technologies that let the luxury SUV kneel to greet you, scan the road ahead for uneven pavement, and allow you to drive away using your smartphone instead of a key. The three-row, midsize premium utility elevates Lincoln’s design vision while delivering on Quiet Flight, a key brand concept that supports tenets of beauty, gliding, human and a crafted sanctuary. 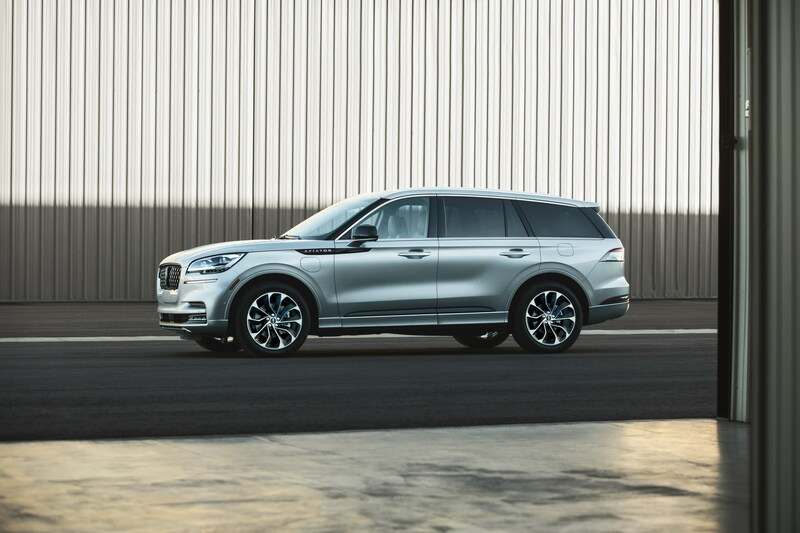 Lincoln Aviator will be available globally, entering the highest volume segment in the U.S., the midsize luxury market, and the third-highest volume segment in China. Also debuting is the Lincoln Aviator Grand Touring, named for its gliding power and effortless performance. This marks the first time the company has combined a twin-turbocharged 3.0-liter V6 engine and advanced electrified hybrid technology capable of delivering smooth performance and instantaneous torque. Aviator offers the kind of capability premium clients require in a three-row SUV, with available all-wheel drive and a choice of gas or hybrid powertrain. The standard twin-turbocharged 3.0-liter V6 engine, paired with a 10-speed SelectShift® automatic transmission, is expected to deliver an impressive 400 horsepower and 400 lb.-ft. of torque for effortless acceleration. With the hybrid option, Aviator Grand Touring’s twin-turbocharged engine and advanced electrified technology is targeted to deliver even greater levels of performance. Projected to produce 450 horsepower and a massive 600 lb.-ft. of torque, the all-new Aviator Grand Touring is expected to deliver greater performance than many three-row, midsize luxury hybrid SUVs. Lincoln Drive Modes allow clients to further customize their drive experience, while a 12.3-inch standard configurable LCD instrument cluster confirms their choices with beautiful, easy-to-read dynamic graphics and prompts. In addition to Lincoln’s five signature settings – Normal, Conserve, Excite, Slippery and Deep Conditions – two new modes are engineered specifically for Aviator Grand Touring. These modes, Pure EV and Preserve EV, allow clients to choose when and how to best use their electric energy, while an enhanced Excite mode maximizes performance. The effortlessness of the overall experience continues as clients enter, using their compatible smartphone as a key to access their vehicle. Lincoln’s Phone As A Key technology, debuting in the all-new Aviator, is activated through the Lincoln Way™ app. It allows owners to lock and unlock, open the liftgate and, most importantly, start and drive the vehicle – all without a traditional key. Phone As A Key offers additional amenities. Drivers can recall individual preferences for adjusting seat, mirror and steering column positions. Comfort and entertainment settings can be activated through the feature as well. If owners want to loan their Aviator to a family member or friend, the technology makes that equally effortless too, as up to four “keys” are provided with each vehicle in addition to the standard smart key fob. Should a phone battery go dead, a passcode can be entered on the standard exterior keypad to gain entry then a backup code can be entered on the center touch screen to start and drive the vehicle. If a phone is lost or stolen, Phone As A Key can be easily deleted, providing additional peace of mind for clients. Also new to Lincoln is an available technology that enables Aviator to “see” potholes or uneven pavement and immediately make suspension adjustments to keep the ride as smooth as possible. Adaptive Suspension with Road Preview uses an advanced forward camera to constantly scan the road, seamlessly adjusting the suspension as needed. The boundless allure of flight has long inspired automotive design, and the all-new Lincoln Aviator takes that inspiration to the next level. Aviator’s iridescent Flight Blue exterior color on display in Los Angeles complements its flowing lines. Lincoln’s signature grille is executed in high-gloss black and chrome accents that beckon the eye, while a wraparound windshield completes the aviation-inspired theme. An all-new Lincoln Black Label theme, Flight, harmoniously combines Luggage Tan and Ebony, further elevating the ambience of the cabin. Bright engine turn appliqués, brushed in small circles, replicate the finish of early aviation instrument panels and enhance the theme. The supple leather of the seats is minimally processed to retain its natural texture. Chalet is another Lincoln Black Label option for Aviator, evoking the contrasting pleasures of mountain slopes and the inherent comfort of an après-ski lodge. With Espresso and Alpine Venetian leathers and deep Silverwood appliqués, each touch is designed to awaken the senses. Another Lincoln Black Label theme available is Destination. Celebrating the art of travel, Destination takes its inspiration from vintage luggage, harkening back to a time when travel was rich with excitement and intrigue. Mahogany Red Venetian leather with an intricate diamond weave on the seats is complemented by smooth khaya wood appliqués – making travel both near and far a true pleasure. Lincoln Black Label is created for clients seeking the ultimate in a luxury experience, offering premium materials in specially curated designer themes and a host of membership privileges. The grille for the all-new Lincoln Black Label Aviator features reverse lattice mesh with a repetitive pattern of strong, bright-finished badge motifs. The signature grille for Lincoln Black Label Aviator Grand Touring features unique Lincoln stars embedded within the quadrants in an elegant chrome finish, while the grille for Aviator Grand Touring is also adorned with the embedded stars. Aviator’s spacious, airy cabin accentuates horizontal lines, minimizing visual clutter to deliver a soothing sanctuary. An available Revel™ Ultima™ 3D Audio System re-creates an authentic concert-hall experience by immersing occupants in rich, superior sound emanating from 28 speakers throughout the cabin. An ergonomically advanced steering wheel is intended for ultimate ease of use and customization; only subtle thumb movements at the 10 o’clock position are needed to access the voice command button. The steering wheel features streamlined, four-way switches at strategic positions to control music, phone and navigation functions. Available Perfect Position seats with Active Motion offer 30-way adjustability, massage capability and additional lumbar support for driver and front-row passenger for paramount comfort, while flexible second-row seats recline, adjust fore and aft, and slide forward for easy access to the third row. The third row provides ample seating with plenty of room left over for cargo, assuring nothing and no one is left behind. Advanced under-floor battery packaging in the Grand Touring edition allows for all the benefits of an electrified powertrain without compromising luggage space or legroom. Other convenience features include an available wireless phone charging pad located in the front-row center armrest, while a handy media bin is available for the front-row passenger. Multiple power outlets throughout the cabin and a standard Wi-Fi hotspot keep occupants connected wherever the journey may take them. Logans Run, scford58, hbmf3 and 1 others like this. Looks great. Love the hybrid. Logans Run, hbmf3 and zipzoomflyfast like this. My favorite pic: the Touring Hybrid Black Label model, with black side accents and that handsome 3D grille. Logans Run and hbmf3 like this. Alright, I am on record numerous times as saying I hate suvs and cuvs. I absolutely love this thing! It just looks so good. The Flight Theme interior is my new favorite. Plus 450hp and 600ft-lbs of twin turbo hybrid muscle sounds good too. spudz64 and glyphics like this.